It was a case of outstaying one's welcome. 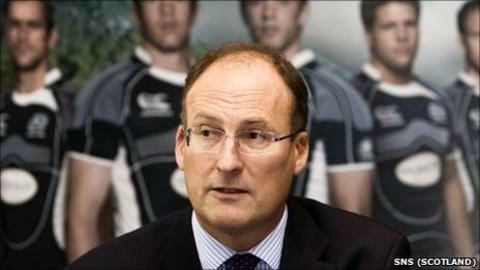 Appointed in 2005 to the role of chief executive of the SRU, Gordon McKie was then the right man for the job. On Tuesday it was clear that times and opinions within Scottish rugby had changed. His legacy is a much-improved Murrayfield, better business practice and a reduced level of debt. But his mode of departure told of an actor who's made one too many curtain calls. Ex-Scotland international Iain Morrison is now a journalist and followed closely Gordon McKie's time in charge of the game in Scotland. He believes that disaffection with the chief executive largely centres on his perceived lack of people skills. "No question, the number of times in the last few weeks and months we heard the phrase 'McKie is the problem', said Morrison. "He managed to alienate a lot of people whether he wanted to or not." McKie's undoubted skills were evident in times of adversity. His speciality was regeneration rather than rehabilitation, and Morrison agrees: "He's used to going in and saying 'this is what we're going to do or this company folds…so just get on and do it'. "He's not used to being argued with and that came over in six years dealing with him as a journalist." Gordon McKie believed himself to be a professional man overseeing a professional organisation. He concentrated on sweeping clear any vestiges of amateurism which may have remained at Murrayfield, so what does his departure mean for the stewardship of the game in Scotland? "I think we have to be very aware of not returning to the bad old days when the club representatives were running the day-to-day business of the union," suggests Morrison. "It's what we've just seen happening at Twickenham. The club representatives have to have a hands-off approach and only interfere when they're uncomfortable with the overall direction the game is taking. "I think that was the case in this situation." Scottish Rugby is now without a chief executive. Jock Millican will fill the gap as interim, but what kind of individual does Scottish rugby need at the helm? "What we need is someone to grow the game, to market it properly," says Morrison. "Someone to bring enthusiasm to the sport. At the same time we need that person to have financial discipline. "It's a bit like the argument we have about our stand-offs. We have Dan Parks who can kick and we have Ruaridh Jackson who can run. We need a fly-half who can do both." In 2009 Gordon McKie appointed Andy Robinson as head coach of Scotland. In September this year Robinson will lead the national side into a World Cup in New Zealand. Does Morrison think McKie's departure in any way affects Robinson's position? "Absolutely not! I don't think he'll worry or lose sleep over Gordon McKie's demise," he said. "I think he'll just get on and work closely with the next chief executive." And that, of course, is the next step: the appointing of a new chief executive of Scottish Rugby. Morrison believes there is one man who could fill the role. "John Steele. He's a very smart guy," he said. "It didn't work for him at the RFU, but that was politics. I think he's a live candidate if he decides to go for it."